The card art can tell you a lot about when a particular event took place, even if it doesn’t evoke anything in your brain. What are the people on the card wearing – what technology level is displayed, etc. There’s always hope. There aren’t many rules to this game, but there is one that, if missed, will greatly alter how the game plays out. I’ve seen it happen, and it isn’t pretty. When playing, make sure to note that if you miss with a card, you discard it, instead of leaving it in the timeline. I’ve seen games where people miss this rule, and leave every card played on the timeline. Not only does the table space fill up quickly, but it becomes harder and harder to end the game, as there are smaller gaps to correctly place a card in. Playing this way becomes an additional penalty, every miss will make it even harder to get a future card right. I’ve heard it expressed as “reliving” history class, where it feels like it will never end. When playing with young players if they miss a card, it is not discarded. It goes to a pile next to their playing area. They also do not have to pick a replacement card. Once they go through the cards in their hand they have to go through the cards next to them. 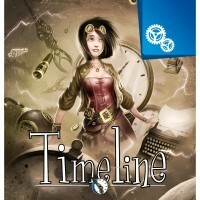 By seeing the card again it helps them to learn where the card goes in the timeline. If they discard the card and pick a new one they might not remember the time for the original card they were having difficulty with. This game can also be played on your iPad. (I don’t know about other devices.) There are two modes of play a timed version and a version that is not timed. Both are fun to play and the cards are the same as in the physical game. There are expansions for the online version available as well. My only difficulty with the online version is that fact I am not sure how I am being scored.